Restoring a Dream offers a unique twist on a restoration tale. Tim tells his personal restoration story from tent camping in the California redwoods to rebuilding two vintage Airstreams. 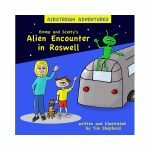 Autographed copies require additional handling fee. 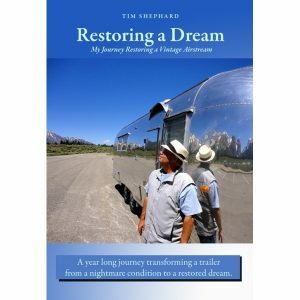 Restoring a Dream offers a unique twist on a restoration tale. Tim tells his personal restoration story from tent camping in the California redwoods to rebuilding two vintage Airstreams. 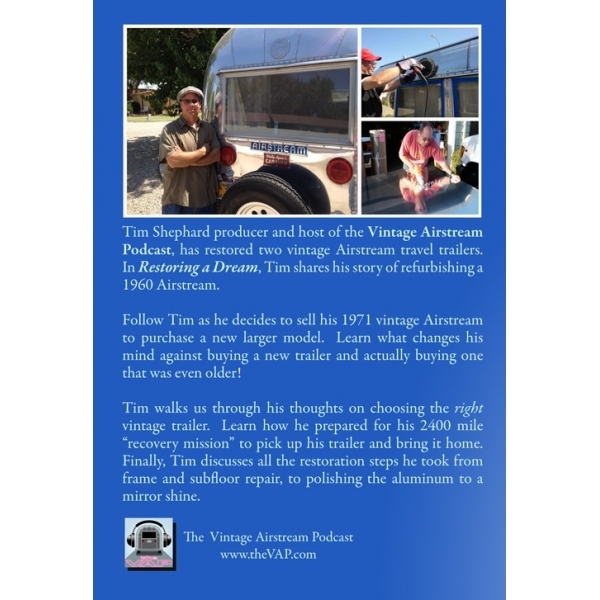 Follow Tim as he decides to sell his 1971 vintage Airstream and purchase a new larger trailer. Learn what changes his mind against buying a new trailer and why he purchases one that is even older! Tim explains what to look out for when ‘going vintage’, how to choose the right vintage trailer, and how to inspect it to avoid costly mistakes. Ride along as he heads out on a 2400 mile ‘recovery mission’ to pick up his 46 year-old trailer, and find out how a year-long restoration takes a vintage Airstream from a nightmare condition to a restored dream. Restoring a Dream teaches you how to buy an Airstream covering the necessary steps in Choosing, Inspecting, Recovering, and Restoring your vintage Airstream. Choosing – How to avoid the “Polished Turd”, Search by Era, Where to find it?, What should it cost? Inspecting – The Semi-Monocoque Design, The ALL leak, Evaluating skin condition, Inspecting appliances, Learn about axles. Recovering – Prepping for the pick up, Getting it roadworthy, Bringing the trailer home. Restoring – Restoration planning, Types of restorations, Common problems, Documenting your work, Getting started, Frame issues, Subfloor repairs, Weatherproofing, Wiring and woodwork, Plumbing and tanks, Replacing appliances, How to polish and much more!